The present study was carried out to compare the marginal microleakage of some newer materials viz. a flowable composite, an injectable resin modified glass-ionomer and a compomer in Class I cavities of 30 non carious primary molars. After 0.5% basic fuchsin dye penetration and sectioning, the teeth were studied under stereomicroscope. The results obtained revealed that flowable composite showed significantly lower microleakage (p<0.05) as compared to injectable resin-modified glass ionomer and compomer. However, no significant difference was observed when injectable resin modified glass-ionomer cement was compared to compomer. This concludes that flowable composite materials adhere better to the primary teeth than resin modified glass ionomer and compomer. A rare case of congenital muscular dystrophy with unique oro-facial manifestations is presented. Dental considerations and successful management techniques are discussed. This study was undertaken to assess the effect of a single application of three professionally applied topical fluoride agents (Sodium fluoride 2%, Stannous fluoride 8% and APF 1.23%) on the surfaces of six modern esthetic restorative materials used in pediatric dentistry viz., two conventional glass ionomers (Fuji II and Shofu-restorative), two resin modified glass ionomers (Vitremer, with and without glaze, and Photac-fil Quick) and two Polyacid modified composite resins (Luxat and Hytac Aplitip). Mean surface roughness and surface micro hardness (SMH) measurements were the parameters employed for comparison. Results showed that APF gel applications significantly increased the surface roughness measurements and decreased SMH of all tested materials, which was pronounced in conventional glass ionomers when compared with resin modified glass ionomers and polyacid modified composite resins. NaF and SnF2 produced a statistically significant increase in the surface roughness of conventional glass ionomers without any significant change in surface roughness and SMH on rest of the materials tested, except for NaF on SMH values of Fuji II, which was statistically significant. Dynamic changes in society with working parents and smaller nuclear families have brought about a sea of changes in parental attitudes and anxieties towards their children. This has affected the perception and implementation of behaviour modification techniques by the dentist. Today, the significance of Tell Show Do technique and its efficiency in behaviour modification is questionable. Insistence of parents on conscious sedation is seen to be on the rise. 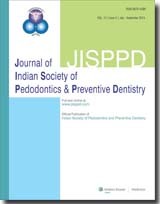 This study aimed to assess the change in the utilization pattern of behaviour management techniques by pediatric dentists of Punjab in the past five years along with identification of change in parental attitude towards these techniques. EEC syndrome is a multiple congenital anomaly syndrome characterized by ectodermal dysplasia, distal limb anomaly, cleft lip and palate and ocular adnexia anomalies. A case report of a 10 year old female patient with EEC is presented and it is emphasised that management of these cases requires a multidisciplinary approach. Early diagnosis will allow parents to get accurate counseling and in particular obtain reassurance regarding the low risk of mental handicap. In the present study, 25% EDTA, in gel form, was used to analyse its micromorphological effects on tooth surfaces with the objective to see the effectiveness of EDTA in etching so as to replace phosphoric acid as an etchant. EDTA has neutral pH (6.4 - 7.4) and is known to open & widen the dentinal tubules as well as remove the smear layer. An in vitro study was conducted on orthodontically extracted premolars with 25% EDTA as an etchant which was applied on prepared tooth surfaces for 15 seconds, 1 minute and 3 minutes. The effects of EDTA gel was observed under SEM and results tabulated and evaluated. There was statistically significant differences between the 3 etching time groups and the results indicate that etching with 25% EDTA for 15 seconds is inadequate. The best results were obtained in the 3 minute time etch group. The results so obtained can be attributed to the fact that EDTA acts selectively and/or requires more time for action. Molariform supernumerary teeth in the maxillary central incisor area are uncommon. This article reports the presence of a molariform mesiodens in daughter and a conical mesiodens in father. Detailed investigation into family history of patients with mesiodens is needed. Though the etiology of this dental anomaly remains unclear, genetics as a key factor in the development of supernumerary teeth is highlighted.